Maiden Pinks are easy-care perennials, ideal for the beginning gardener. 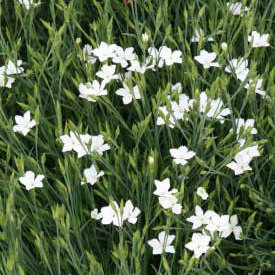 The plant forms a low, spreading mound of evergreen leaves, studded with tiny white starry flowers in late spring, then on and off through the summer. Shear back lightly after first blooms fade. Good choice for poor soils and hot sunny sites, nice in the rock garden. Also excellent in tubs and mixed containers. Plants are easily divided in early spring or fall.